Your home is your own corner of heaven — a place where your family members will interact, enjoy quality time together, and share important events; the nest in which you’ll raise your children; the palace you’ll return to whenever you need comfort and calm. A family home is a space for traditions and heirlooms, to-do lists and laundry, and sticky fingerprints that are frequently removed from the walls. It’s a collection of rooms that are familiar and beloved; a shelter from harm. Your home is your world, and decorating it can become something of a labor of love. Before you begin waving color charts or wielding brushes, consider how each room of your home is to be used, and how you can preserve the functionality of the space. For example, your kitchen will require plenty of clear surfaces and storage space, while the bedrooms should be reserved for moments of calm and restfulness. Decorating your home should be as much about furniture and accessories as it is the shades you’ll be using — ensure you’re creating a home that works for your growing family. Decorating a family home is a fantastic opportunity to experiment with colors, patterns, and shapes; if you can’t mess around with primary colors and geometrics when you’re raising a young family, when can you? A family home should be bright and friendly, fun and practical. If you’re nervous at the thought of applying bold colors, consider using wall decals, borders, and colored soft furnishings to add character to each room. These can be changed at regular intervals, allowing your family home to grow and change as its occupants flourish. Natural light is one of the greatest resources we have access to, and yet so few of us make the most of the sunlight that bursts into our homes on a daily basis. Sunlight has the ability to brighten the smallest of spaces, lighten those dark, unfriendly nooks, and make even the pokiest of spaces appear large and welcoming; it’s a miracle worker that so many homeowners have yet to harness. Installing plantation shutters is a great way to make the most of natural light, controlling its flow in and out of the home, and helping to regulate the temperature during periods of extreme heat or chill – oh, and they look incredible, too. It doesn’t matter how carefully you decorate your home — if it’s filled with clutter, few people will notice the consideration you’ve paid to color. If you’ve decided to decorate your home, dedicate a little of that time to the kinds of storage you have available. Can you get rid of a little clutter along the way? Are you really making the most of the space you have available? Funky toy boxes and hanging baskets are fantastic for children’s toys and belongings, while cupboards under the stairs are seldom used to their full potential. Finally, never allow yourself to be ruled by home décor sites or mood boards; your home is a safe haven from the world outside, and should be decorated to reflect your family’s passions, characters, and quirks. By all means take inspiration from elsewhere, but don’t let yourself be dissuaded from hanging your children’s artwork, or allowing your little people to choose how they decorate their rooms. Stamp your family members’ personalities on those walls, and ensure that decorating your home becomes a real group effort — your family home should show a little piece of everyone. The colors, patterns, and accessories that you choose to adorn your home are, of course, up to you. 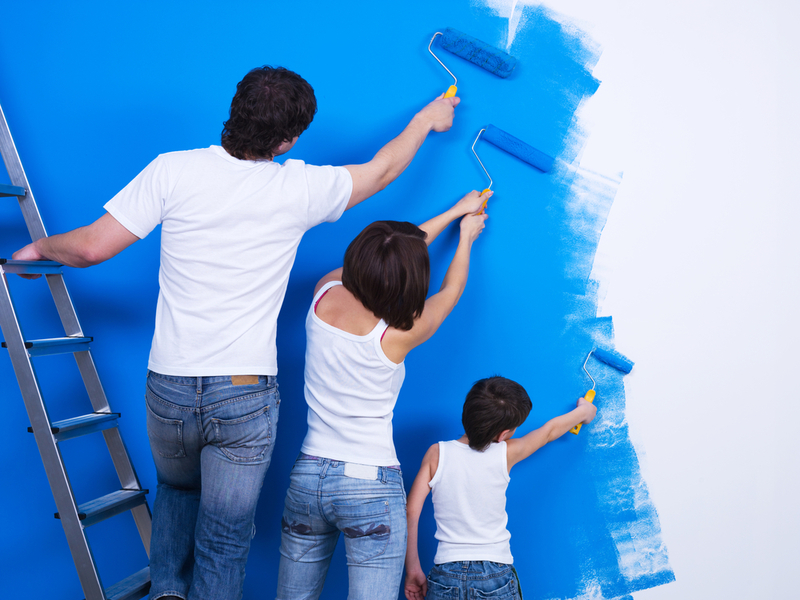 When decorating your family home, you can pay as much, or as little, notice to sites such as Instagram and Pinterest as you wish. What really matters at this point is your budget and determining how your family will be using those spaces over the coming years. Make your mark, allow your children’s personalities and creativity to shine through, and always, always, strive to make yours a happy home. It’s the least your family deserves.